Yesterday was a beautiful sunny Sunday, just perfect for an outing to celebrate the fact that I, along with millions of other people, still have affordable health insurance that provides good coverage. And where did Clif and I go? 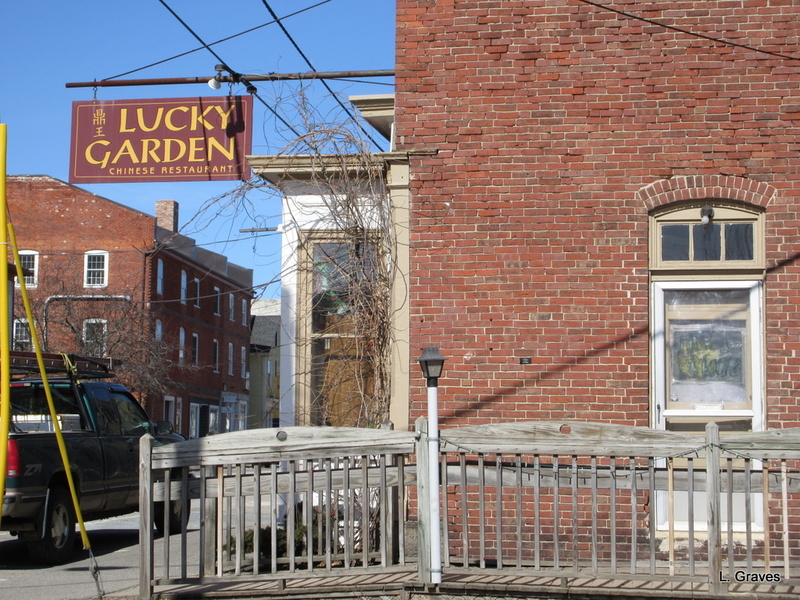 Why to Lucky Garden in Hallowell, of course. I was feeling extraordinarily lucky. And grateful. Lucky’s was full of people, and the atmosphere was lively, even festive. Perhaps I wasn’t the only one who was relieved by the turn of events on Friday? 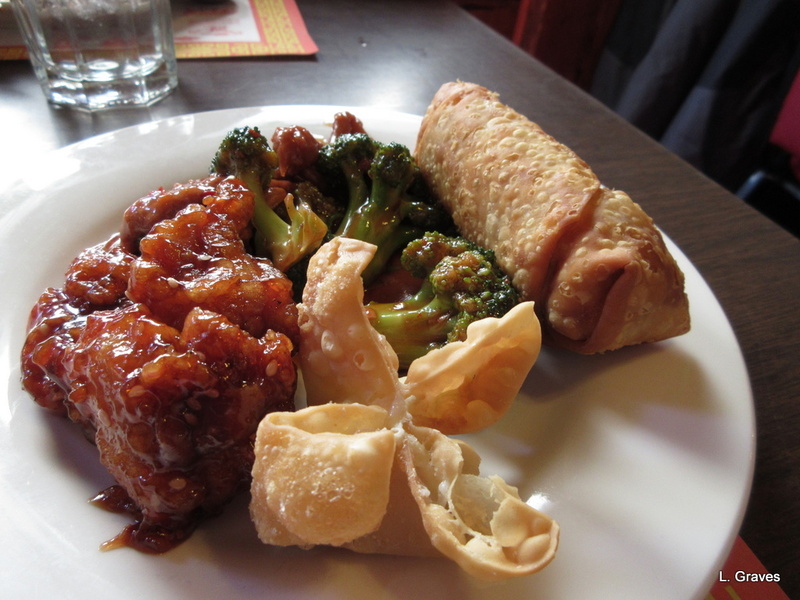 At any rate, the food on the buffet was hot and fresh, and Clif and I had very tasty meals. 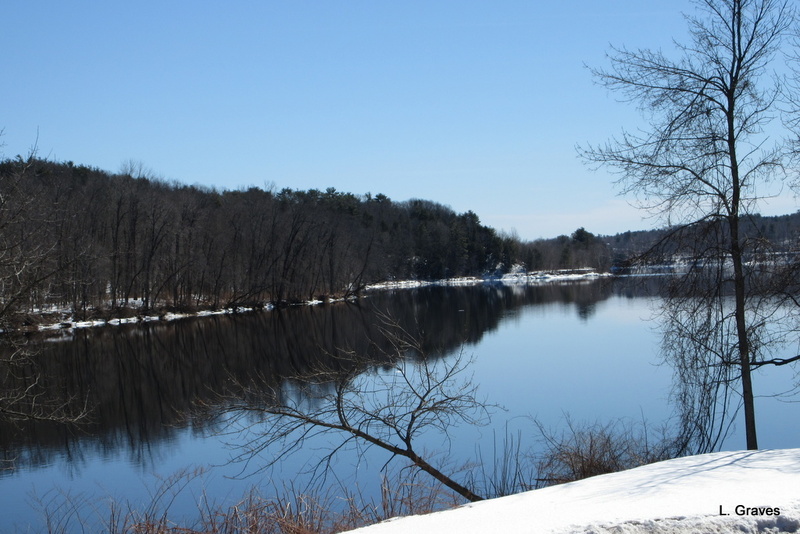 When we came out, we stood on the deck and took pictures of the Kennebec River. The ice chunks are gone. Surely spring can’t be far away? After that, it was on to Falmouth, just outside Freeport (home of L.L. Bean) to check out the Goodwill. We had heard that it was an extra special Goodwill because it is an affluent part of Maine. Well, maybe we just hit it on an off day, but the Falmouth Goodwill is no better than Augusta’s Goodwill. However, all was not lost. Next to Goodwill is The Book Review, one of those special bookstores that makes you want to come back again and again. As soon as we entered, I was smitten. First of all, there is that lovely smell of books. Second, there are dark wooden shelves. Third, the many comfortable chairs tucked here and there. And, finally, and most important, the books themselves, a wonderful selection that would appeal to a wide variety of readers. I headed right toward the children’s section. While I do read novels written for adults, it seems to me that I really do prefer middle reader and young adult books. Clif and I discussed this on the way home. Clif is right. As a reader, I place great value on clarity of writing and clean storylines. Or maybe it’s just a case of arrested development. Whatever the reason, I know I’m not alone. Many adults, especially women, like middle reader and young adult novels, and my own Maya and the Book of Everything is developing quite a following among adults. Naturally, I bought some books at The Book Review. 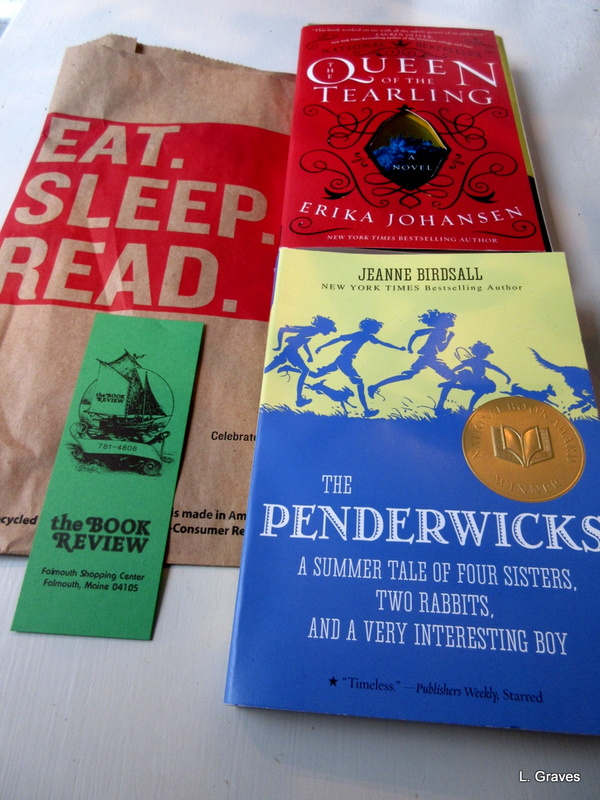 Last night, I read The Penderwicks, a middle reader book, in one greedy gulp. It’s a gentle, almost old-fashioned story of four sisters and the misadventures they have on their summer vacation in the Berkshires. There are dark threads woven in—the mother has died of cancer, and Rosalind, the eldest, reflects on how she doesn’t have time or energy to nurture plants when she is so busy nurturing her sisters. (I’m paraphrasing. Jeanne Birdsall phrases it much more eloquently.) The ending is satisfying—happy, even—but realistic, too. The children don’t get everything they want. There are several more books in the series, and I intend to read every one of them. And when I’m back in the Falmouth area, I will definitely go to The Book Review. It was just such a relief – definitely something worth celebrating. I know that health care is not out of the woods and that there is much that can be done to sabotage it on the part of the current administration. But ACA is still alive to fight another day and that is much more then I had thought was going to be possible. A big relief! I felt as though a huge weight had been lifted from me. Have you ever been to The Book Review bookstore? If not, then maybe we can go when you come for a visit. Such a wonderful bookstore! Righto! Such a wonderful bookstore. A fine way to celebrate! Nice celebration day! I love, love, love the Penderwick series (one of my goats is named after the youngest sister, Battie!). 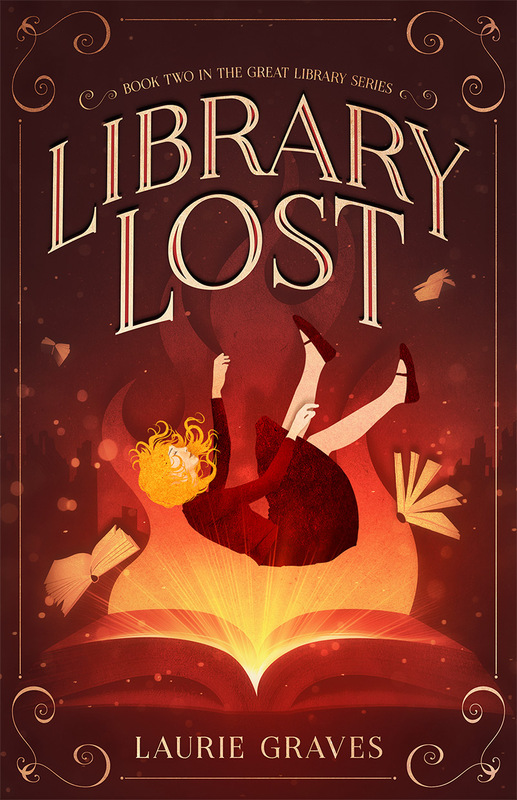 Having been a young adult/children’s librarian all my working life, I still usually prefer YA reads. I am enjoying your book, too! How cool that one of your goats is named Battie! And, it’s way cool that you’re enjoying my book. Sure brightens up a rainy Monday. Great post, Laurie! Small book stores still exist, we might be able to afford our mammograms and colonoscopies this year, and spring is coming. Thanks, Jodie! Thank bookstore is quite the gem. And, to be able to afford health care, even the tests that are no fun at all, is a great relief. So true about bookstores, antique shops, and churches. Colonoscopies, not so much. However, when the tests are unaffordable, the stress level is that much higher. Here’s an article I thought you would enjoy, Laurie: http://www.npr.org/2017/03/27/521648929/in-maine-a-common-language-connects-french-canadians-african-immigrants?utm_source=facebook.com&utm_medium=social&utm_campaign=npr&utm_term=nprnews&utm_content=20170327. It has nothing to do with this blog post–should go on your earlier Franco-American post! Wonderful piece! Thanks so much for sharing. Two cultures coming together over a common language—French. I am glad for you and millions of others that your health insurance is safe – for the time being. Also glad to have a new book store to visit and a new book to put on my reading list. Thanks. Right! For the time being. Never pays to be too smug.